The maintenance of genetic diversity is very important for the fitness of individuals and the survival of species. Essentially, species need a variety of genes to prevent disease and extinction in the wild. Therefore, a population with high genetic diversity has a higher ability to adapt in the face of changes. It was originally thought that marine fishes with large population sizes would be protected from loss of genetic diversity. However, this view is currently being challenged. 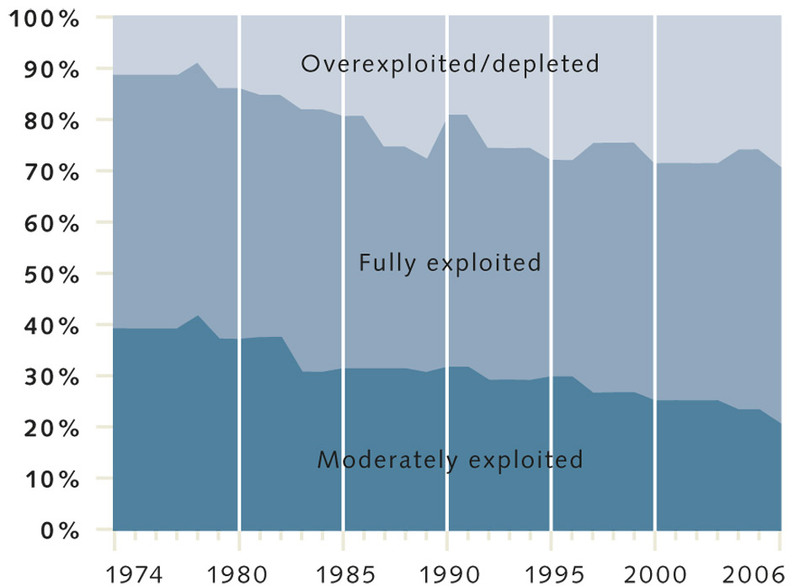 With the state of world marine fisheries worsening (Figure 1) and the rising trend in the proportion of overexploited fisheries, it is increasingly important to understand how overexploitation impacts the genetic diversity of populations. Samples from marine fishes before and after population declines are rarely available, making comparisons between healthy and overfished populations difficult. To overcome this issue, Pinsky and Palumbi (2014) used data on genetic diversity across species. It is well documented that closely related species have similar genetic diversity. Assuming this, the authors measured genetic diversity in overfished populations and used closely related species at the genus or family level that have not declined as control. Pinsky and Palumbi used the RAM Legacy stock assessment database to identify 140 species – 32 overfished in the last 50 years and 108 not known to be overfished – and compiled data from 202 studies on 11 049 molecular markers called microsatellites (a set of short repeated DNA sequences, which vary in number in different individuals). Since genetic diversity can be influenced by factors other than fishing, the authors used mixed-effects models to account for the effects of latitude (genetic diversity tends to decline towards the poles), body size (diversity is generally higher in fishes with smaller body sizes) and different molecular markers because markers that can be used in different species (cross-species) tend to have lower diversity. 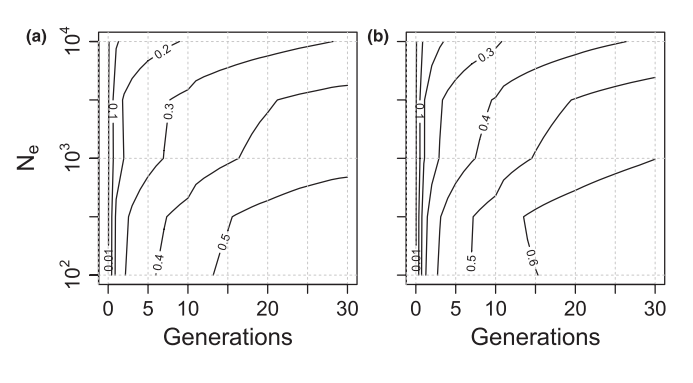 The authors also simulated the process of genetic drift in populations with either discrete (one generation at a time) or entirely overlapping generations (more than one generation at a time) that declined by either 50% or 90%. Genetic drift is a mechanism of evolution that changes the frequency of a particular allele in a population due to random sampling. An allele is a gene with two or more different forms that can result from mutation. Basically, it means that some individuals may leave more descendants (and genes) than others, just by chance. This process is very important since it may cause the loss of some variants of genes and consequently a reduction of diversity. The study found that overfished populations had slightly fewer alleles and slightly lower heterozygosity than in control populations (note that heterozygote is an individual with two different forms of the same gene or alleles). The mixed-effects models indicated that the number of alleles in overfished populations was 11.7% lower. Also, the number of alleles and heterozygosity decreased with increasing latitude (i.e. lower at the poles). Figure 2: Expected loss of alleles in the entire population (contour lines indicate proportion of alleles lost) in a species with discrete generations (a) or overlapping generations (b). For a sample size of 50 individuals, the simulations suggested that populations with smaller initial effective sizes or number of individuals that contribute offspring to the next generation had a faster loss of alleles and that genetic diversity losses happen sooner in species with overlapping generations (which is generally the mating system in marine fishes). However, when the entire population was examined, the decline of number of alleles was much faster (Figure 2). Additionally, the simulations indicated that dramatic and prolonged declines in abundance may often cause loss of genetic diversity and the declines tend to intensify with time. In summary, this study suggests that overexploitation reduces genetic diversity across a wide range of marine fishes. The processes of selection and genetic drift reduce diversity at different magnitudes depending on factors such as initial effective population size, the length of time and the degree to which effective population size is reduced, and the amount of gene flow (the transfer of genes from one population to another). The recovery of genetic diversity can happen through mutation or immigration from refugia. The process of mutation is very slow whereas immigration can act faster and over fewer generations, thus the occurrence of populations with high genetic diversity is critical for the maintenance of the adaptive capacity of exploited populations. Considering genetic diversity when managing marine fish stocks is critical. A better understanding of the genetic impacts from overharvest will allow fisheries managers to respond to the demographic and ecological impacts of overfishing and allow management for genetic diversity.